The glossy cover of Fran's book, resting atop my laptop. Notice I already had a bookmark in it. I received it Monday, although I didn’t check the mail until after midnight so it was really Tuesday. And I just about screamed in joy when I saw the little key in my box that meant I had a package in the big boxes. I knew exactly what it meant. I ripped the package opened and drooled over the book before I even left mail room (as I think of it). Cradling it gently in my arms, I hurried home. Now, I could continue for pages about how I just stared at it, still in complete disbelief that I actually know someone who’s published a book. Not just that self-published, check me out kind of published. A for real, approached by an editor published. And I know her! I’ve been talking with Fran online (although I look forward to the day I get to cross paths with her at a convention.. somewhere…eventually) for a year now and she’s a wonderful person. Sweet as honey, gentle as a bunny. (Hey, that rhymed!) And so humble. I tell this woman that she’s an inspiration to me and what does she say? Shanna – You’re one very talented lady. Inspiring you is an honor and something akin to inspiring an already blazing sun to a lasting supernova. Poetic, humble and most especially, flattering. See what I mean about the sweet as honey bit? Once I got over the delectable joy of knowing and being friends with someone with their own book, I dived in head first. Or nose first, really, since it went right between the pages and my hubby had to pry the book away from my grasping fingers. The first tale in this collection is called “Beach of Dreams.” It was born in a flash fiction office at Zoetrope Virtual Studio where horror writers meet in friendly competition. Fran has a talent for painting scenery with words. Her vivid imaginary world comes to startling life on the page and you’re sucked in, unable to set the book down for fear it would disappear. The story begins in a crazy frenzy, thrusting you into a strange culture and an even stranger occurrence. Filled with terrifying tense and painful moments, it comes to a heart-rending conclusion. Then you truly understand the meaning behind the title. That story is followed by a tale I was around to witness the birth of last year. It’s a short diddy entitled “Gravy Pursuits.” And if I remember correct, she won the flash fiction contest that week for her satisfying tale. She gets the point of the story across with out a single horrible image and in such a sweet, kind way that the conclusion will make you put the book down, look at it and then ponder how a nice lady like Fran can write something like that. 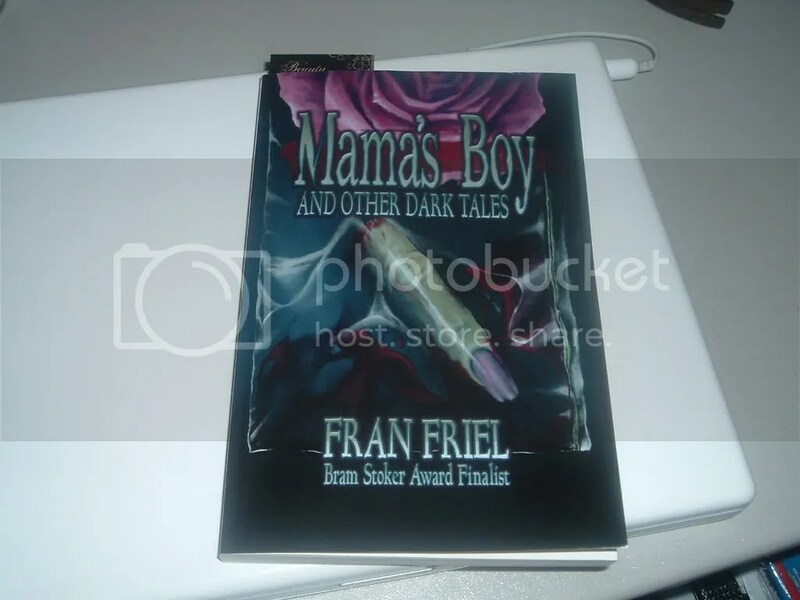 When I first “met” Fran last year and learned this awe-inspiring fact about her, I was gnawing at the bit to read “Mama’s Boy.” Even though it had been made into a stand alone book by Insidious Publications, I was unable to secure a copy. It had already sold out. Then fortune shined down on me. “Mama’s Boy and Other Dark Tales” is a collection of stories that will stay with you for years to come. (I’m sure not going to forget it for a while. A long while.) So stop by Apex Book Company and pick it up now. To learn more about Fran, visit her internet Lair at www.franfriel.com. Oh, girlie, you make me blush. I’m SO happy you enjoyed the collection and I’m glad it didn’t disappoint you after all the waiting. Thank you so very much for writing an extraordinary review. I’m truly blessed to have you as a friend. Wow, this is one rockin’ review! Oh the agony, I can hardly contain my excitement for this sucker to hit my doorstep. Fran, you are very welcome. And thank you for putting links to this post everywhere. Erik… you should have seen me. I got the email that it was being delivered on the 9th and I checked the mail every day (heh, even Sunday, though I knew better). My husband just kept laughing at me.